The Cape Henlopen High School varsity golf team competed in the 2010 Henlopen Conference Championship May 20, and came away with a seventh place finish. Senior co-captain Casey Anderson led the Vikings with an 85 on the par-70 course, followed one stroke behind by Devin Medd. Nicholas Purnell shot a 91, while senior co-captain Connor Jones finished the team scoring with his 94. 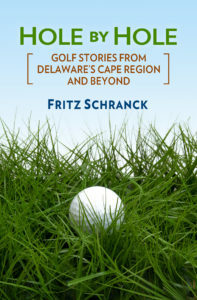 The Vikings are practicing during the week of May 24 at Rehoboth Beach Country Club and Kings Creek Country Club, the Cape Region courses that have supported the squad for many years. The team also qualified for the state championship tournament, to be held June 1-2 at Maple Dale Country Club in Dover. Anderson, Medd, Purnell, and Jones will represent Cape in this final event of the season. During a recent Shawnee CC Tuesday night league competition, I teed up on the short par-4 seventh hole, which often presents problems for me. It’s not the hole’s fault. The 315-yard test from tee to green is, for better players, a relatively easy par, requiring (for them) a long iron and then a wedge shot to a tightly guarded green. When I play it, however, I tend to use my driver off the tee, which then brings the forest left of the fairway into range. During the league match, that’s exactly where my high hooking tee shot was heading, until it hit a tall tree sitting just outside the cart path at the edge of the woods. The ball nicked into the branches, rattled a bit up there, and dropped straight down into playable rough. Danny Simmons, playing in the group approaching the nearby 6th green, looked over at the noise and then at me. “Looks like you paid your dues,” he called out. That’s one of the best non-stock variations on the usual stock golf phrases that I’ve heard recently. If Simmons had been sticking to the usual script, he would have called out, “Members bounce.” He therefore earns points for relative originality, often in short supply on the golf course when reacting to putts or strokes. What’s so unusual about this situation? A recent USGA Ruling of the Day at the golf organization’s website presented an unusual situation involving a mistaken impression. See if you can pick out what was so odd about it. A player’s ball came to rest 20 yards over a green and beyond a white stake which the player’s caddie said was a boundary stake. The player played a provisional ball which came to rest short of the green, but closer to the hole than his original ball. The player played the provisional ball onto the green. At that point, he walked behind the green towards his original ball, which had been visible all along, and discovered that the white stake was not a boundary stake and that his original ball was in bounds. What is the ruling? Answer: The player should have determined the status of his original ball before playing a second stroke with the provisional ball and, since the original ball was not out of bounds, he should have abandoned the provisional ball. When he failed to do so, the second stroke with the provisional ball was a stroke with a wrong ball…. In match play, the player lost the hole…. In stroke play, he incurred a two-stroke penalty … and was required to hole out with the original ball. If you guessed the unusual part was that the player had a caddie, you win. Caddies are now an endangered species at most golf courses. That trend is not inevitable, however. Cape Region clubs should begin thinking seriously about re-instituting a caddie program for this summer. As this paper reported elsewhere, job prospects for local teens are not so great this year, as the recession continues. A well-run caddie contingent would put some pocket change into some pockets that could use it, and also help develop the next generation of local golf talent.